Lawrence Paska, Ph. 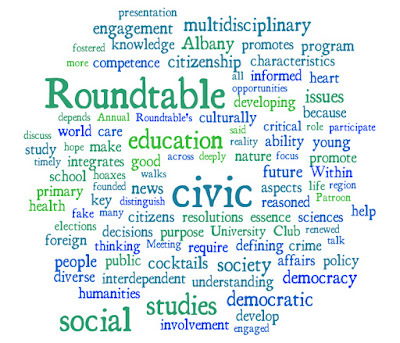 D., Executive Director of the National Council for the Social Studies (NCSS), will discuss the role of civic education and civic engagement in a democratic society at the Albany Roundtable’s Annual Meeting at the University Club. Evening includes social hour with light fare and open bar, presentation of scholarship and Good Patroon award. Join us! Former Supreme Court Justice Sandra Day O’Connor said, “The practice of democracy is not passed down through the gene pool. It must be taught and learned anew by each generation of citizens.” In June, the Albany Roundtable will welcome the Executive Director of the National Council for the Social Studies (NCSS) as our Visiting Speaker. Lawrence Paska, Ph. 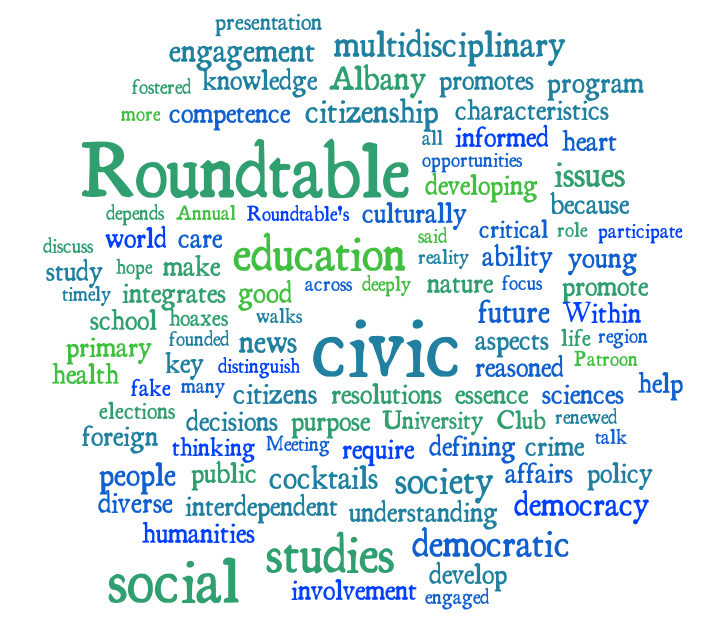 D., will discuss the role of civic education and civic engagement in a democratic society at the Albany Roundtable’s Annual Meeting on Thursday, June 15, 2017. The event is open to the public, and will be held at the National Register-listed University Club of Albany, 141 Washington Avenue at Dove Street. The meeting will take place from 6:00 – 8:00 p.m., and will feature a social hour with cocktails and hors d’oeuvres, a short update on the Albany Roundtable Civic Luncheon Series, the presentation of the Good Patroon Award to journalist, author and educator Paul Grondahl, the presentation the Albany Roundtable Scholarship for Civic Leadership, and a talk by the Visiting Speaker. Tickets are $40 and include light fare and open bar. Social studies is at the heart of civic education, as it integrates the study of the social sciences and humanities to promote civic competence. Within the school program, the primary purpose of social studies is to help young people develop the ability to make informed and reasoned decisions for the public good as citizens of a culturally diverse, democratic society in an interdependent world. In essence, social studies promotes knowledge of and involvement in civic affairs. And because civic issues--such as health care, crime, and foreign policy – are multidisciplinary in nature, understanding these issues and developing resolutions to them require multidisciplinary education. These characteristics are the key defining aspects of social studies. Dr. Larry Paska began his career as a middle school social studies teacher and later served in multiple roles at the New York State Education Department (NYSED). Among his contributions at NYSED were serving as a P-12 state social studies specialist and establishing the Office of Educational Design and Technology in P-12 Education. Prior to joining NCSS , Dr. Paska served as the Director of Professional Development for the Southern Westchester Board of Cooperative Educational Services (BOCES), where he and his team provided instructional programs and services for 32 public school districts in the greater New York City region. He earned a B.A. in History and an M.A.T. in Social Studies from Union College (NY) and a Ph.D. in Curriculum and Instruction from the University at Albany (NY). The Albany Roundtable’s previous Visiting Speakers have included Matt Tomasulo, “Chief Instigator” behind Walk [Your City]; Dr. Mindy Thompson Fullilove, author of Urban Alchemy: Finding Joy in America’s Sorted Out Cities; Kaid Benfield (People Habitat: 25 Ways to Think About Greener, Healthier Cities); Jeff Speck (Walkable City); John Norquist (CEO, Congress for the New Urbanism); Janet Flammang (The Taste for Civilization); Colin Beavan (No Impact Man), Jaime Correa (planner, architect and professor at the University of Miami) and others. Tickets for the reception must be purchased by Tuesday, June 13. For more information or to RSVP, follow this link, email albanyroundtable@yahoo.com or call The University Club at 518-463-1151.